Realizing a talent early in life, Sharon began drawing portraits of family and friends and soon discovered her natural inclination for portraiture. She honed her talents with studies at the Pittsburgh Art Institute, and life drawing classes at the Columbus College of Art and Design, private lessons with a local portrait artist and training through local and regional workshops. She has completed many commissioned portraits as well as still lifes and landscapes. Over the years her work has hung in various galleries and shows throughout Ohio including the Kuhn Fine Arts Gallery, Ohio State University, Marion, Ohio, the Schumacher Gallery, Capital University, Columbus, Ohio, the High Roads Gallery, Worthington, Ohio, The Art Castle, Delaware, Ohio, Columbus Cultural Arts Center, Columbus, Ohio, and The Springfield Museum of Art, Springfield, Ohio. Memberships include Portrait Artists of Mid-Ohio, Brush & Pallette Art Group, Mansfield, Ohio, and Portrait Artisits of America. 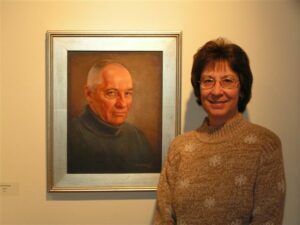 Along with her passion for portraits she enjoys painting landscapes and is a member of the Ohio Plein Air Society. Sharon also has inspirational designs woven as tapestry throws made by LoomCraft, Inc. of Belton, SC.